KANSAS CITY, Mo. -- The vote count in the race for the Republican nomination for Kansas Governor changed several times Thursday after several discrepancies were discovered. After the initial mistake was revealed in Thomas County, 41 Action News went county by county and uncovered several others. There were 100 fewer votes for Gov. Jeff Colyer on the Secretary of State's website than what Thomas County, Kansas reported. 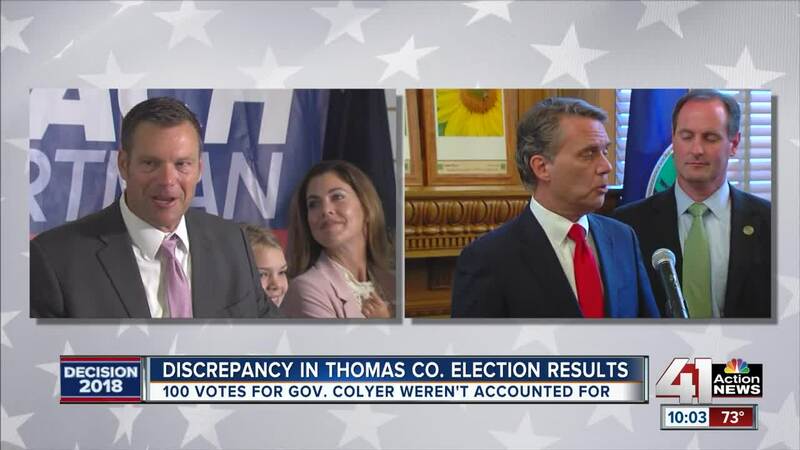 A fax from Thomas County shows Colyer receiving 522 votes, but the Secretary of State's website had 422 as their count. This decreased Secretary of State Kris Kobach's lead from 191 to 91 votes. In Haskell County, the Secretary of State’s website reports 103 votes for Colyer and 110 votes for Kobach. On the Haskell County website, the county clerk reports 220 votes for Colyer and 257 votes for Kobach. When reached by phone, the county clerk’s office confirmed the results on its website were correct. The office said the initial results it sent to the Secretary of State on Tuesday night were 103 votes for Colyer and 110 for Kobach. On Wednesday morning at 6:01, the county sent the updated results after it double checked the vote totals. Those new numbers were never updated on the Secretary of State’s website. The Secretary of State’s Office told 41 Action News Reporter Steven Dial they noticed the discrepancy as well. They are now going county by county to check the election results. With the discrepancy in Haskell County, Kobach's lead increased to 121 votes. Vote totals from Wyandotte County were updated on Thursday, which led to discrepancies with totals reported on the Kansas Secretary of State website. On the Wyandotte County website, Colyer was reported as getting 1,532 votes while Kris Kobach received 2,714 votes. However, on the Secretary of State website, Colyer was reported as getting 6 more votes while Kobach received 23 more votes. Wyandotte County Election Commissioner Bruce Newby spoke to 41 Action News shortly after the discrepancies were discovered. He said results from the primaries were unofficial on Tuesday night and an audit done afterwards found issues with the numbers initially sent in. Newby explained that the discrepancies all revolved around problems with the encrypted USB drives containing voting information from each precinct. Results from one Wyandotte County precinct were reported twice after a backup encrypted USB drive said it had no data on it when it actually did. After believing the first one had no data, election officers uploaded the results from another encrypted USB drive. The incident led to results from the precinct being tabulated twice. Newby also told 41 Action News that another precinct's encrypted USB drive said no votes were cast. 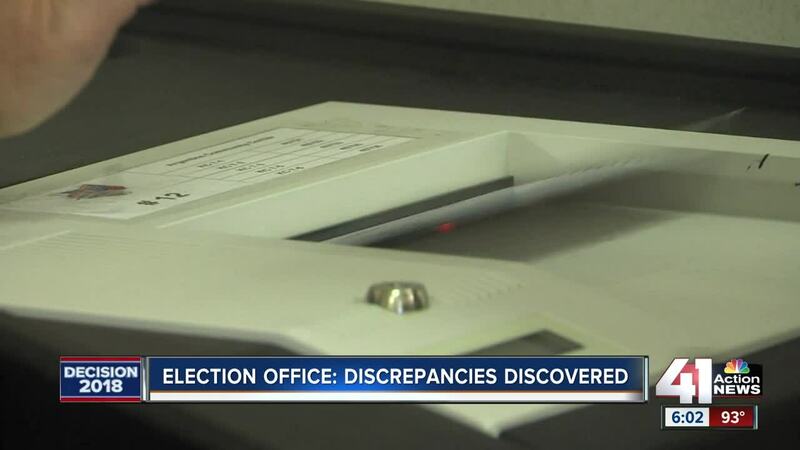 Election officers knew this wasn't the case and later sent in updated information to the Secretary of State's Office. Newby said Wyandotte County uses the same vendor but not the same voting machines as Johnson County, which dealt with slow uploading times of the encrypted USB drives on primary night. With the changes in Wyandotte County, Kobach's lead fell to 104 votes. The election results on the Elk County website show 233 votes for Colyer. The Secretary of State's website had 229 votes. Both websites show 258 votes for Kobach. 41 Action News reached out to Elk County to find out what caused this difference, but we have not heard back. With this discrepancy, Colyer trails Kobach by 100 votes. 41 Action News Reporter Ariel Rothfield spoke with the Director of Elections on Thursday. He says the state discovered some of the issues through a routine verification process, which happens the day after the election. "We do make mistakes, which is why we have verification," said Brian Caskey. "Our verification system worked." Caskey said that after the last county reports election results, his office immediately sends all of the results back to each county to verify the numbers. He said that's when Thomas County noticed the error in their results. "I take exception to the fact that it would be done on purpose," Caskey said. "We are humans, we make mistakes. We would never, ever, ever do an error on purpose and I take exception to that." He also stressed that when information about results are released on election night, they are unofficial because they haven't been verified. "The purpose of election night is to provide information," Caskey said. "We do it as quickly as possible because the public wants to know. It is unofficial in part because we haven’t had time to do all of our validations and checks." Meanwhile, the vote total will change again. There are still thousands of provisional ballots to be counted statewide.